Donald Trump seemed to surprise his wife, Melania Trump in front of a national TV audience on Thursday when he revealed that his wife had agreed to deliver some speeches as the campaign trail comes to an end. 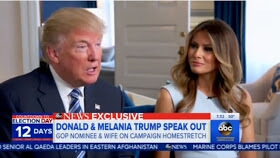 Trump delivered the 'surprising' news in a sit-down interview alongside Melania on ABC's "Good Morning America,"
Asked by host George Stephanopoulos if she wants "to get out there yourself and help (Trump) out in the final two weeks," Melania Trump said "we'll see" before Trump interjected. "She's actually going to make two or three speeches," Donald Trump said. "She's amazing when she speaks. She is an amazing public speaker. So she's agreed to do two or three speeches, and I think it's going to be big speeches, important speeches. I think it's going to be great." 0 Comment to "Melania Trump to give two or three 'important speeches' "